I've found myself lacking any real spiritual growth recently. I was doing so well at the beginning of this year. I was reading my Bible every day and you could tell. I had more patience with everyone in my life. I handled things better. I just felt better all around. Once the kids got out of school for summer, I fell out of my good habits. I stopped reading the Bible every day and all of those peaceful feelings just fell away. I still haven't gotten back into a routine. I need a little boost to help me. because I was hoping it would be the boost that I needed to get back on track. When I requested the book I didn't realize it was written by a pastor who passed away in 1919. Once I found that out, I didn't know what to expect. It's been almost one hundred years since his passing. Would prayers be different now than they were then? Could I even relate to these prayers? What I found out is that Mr. Blumhardt wrote these prayers with a timelessness that transcends all time periods. The prayers that were relevant then are still relevant today. The prayers are simple and to the point. "Blumhardt's central insight might be described as "active expectation"--that is, faith that God's kingdom is not some distant hope for the afterlife, but a present power that can transform the world here and now." 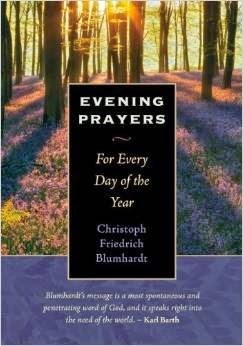 There is an evening prayer for every day of the year. It even includes an evening prayer for February 29 for the years that have a leap year. Each day includes a Bible verse and a prayer. The prayers are nice because they allow us to not only focus on ourselves and our own problems, but on God's presence everyday in the lives of every person on Earth. The prayers bring about a sense of how we are all intertwined and connected through His works. It is understood in these prayers that God's will will be done on Earth. There is no question to that in these prayers. The words are simple, but the meaning is great. These prayers are prayers of thankfulness to God and prayers that we may be steadfast in our faith, even during trying times. Mr. Blumhardt's words were relevant when he first wrote them and they are even more relevant now. I'm happy that Mr. Blumhardt's devotions were compiled together like this into this newly revised edition. They are the perfect way to end the day. When I sometimes struggle to reach for the right words to pray to an almighty God, Mr. Blumhardt does it so simply. Disclosure: I was given a copy of this book in order to facilitate my review. All opinions are 100% mine and I received no other compensation.